The thrill of the Rexona ‘Be the Next Champion’ campaign “train” stormed the Brong Ahafo and Western regions in search of football talents for the grand finale scheduled to take place at the Accra Academy football pitch next month. 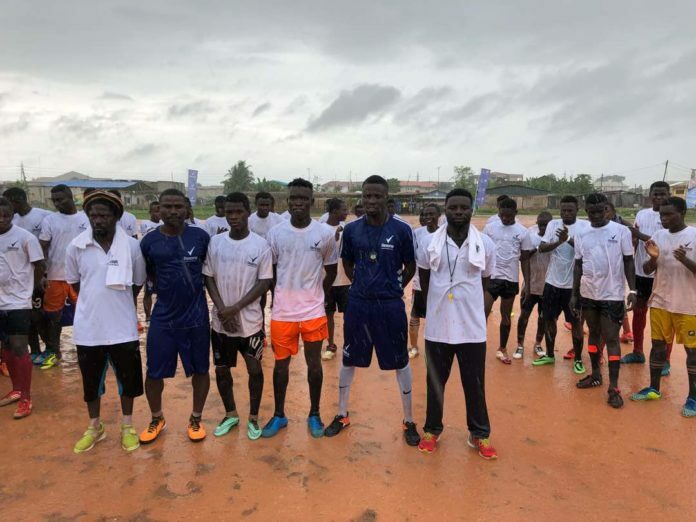 According to a press release copied to Newsghana.com.gh, the football aspirants gathered at the Fiapre Roman School Park in Sunyani and Kwesimintim SDA Park in Takoradi to display their skills and abilities with the hope of being selected to represent their region. The official coach, Laryea Kingston took the players through physical drills and trials to evaluate their capabilities. At the end of the session, Gilbert Yeboah and Agyemang Boakye emerged winners to represent the Brong Ahafo region whereas Franklin Buah and Joseph Quansah were selected as the best for the western region. The winners of the two regions were full of excitements and expressed their gratitude for the opportunity given to them by the Rexona ‘Be the Next Champion’ campaign. The scouting exercise continues in the remaining five regions with the next stop being Abura Town Park in Cape Coast on Wednesday 20th June 2018. The rest of the trials for the week will go on at the Koforidua Methodist Park (Koforidua Poly) in the Eastern Region on Saturday, 23rd June. In the following week in Volta region, at the Police Depot Park – Ho on 25th June, and in Kumasi, aspirants can visit any of these parks; Red Park (Asawasi)- Friday 29th June and on Saturday 30th June at Sakraska Park at Abuabo.